Today, the FDA has announced their plans to hold a public meeting of the Obstetrics & Gynecology Devices Panel on September 24, 2015 to discuss scientific data regarding Essure’s safety and effectiveness. The FDA will invite feedback from presenters, panel members, and the public in this meeting to inform recommendations and next steps about Essure. This announcement comes from a public outcry from thousands of women reporting adverse events from having Essure implanted. Over social media, the presence of women angered by this medical device is outstanding. On Facebook alone, the group Essure Problems just announced their total of 18,000 members today. They took to Facebook and Twitter today to express their concern and the injustice in being delayed the announcement by at least three hours. While there was a wait to hear the update, it comes with a victory for the women affected by Essure. 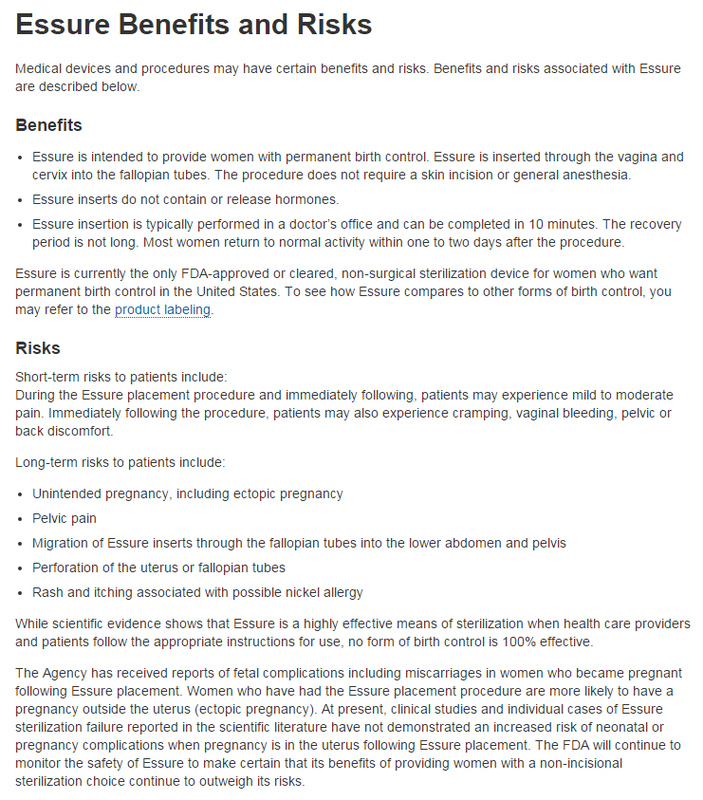 Not only will the FDA be holding the panel in September to further look into feedback about the safety and effectiveness of the implant, but they officially updated the “Essure Risks” section of the FDA page related to Essure. The risks added by the FDA include unintended pregnancies, pelvic pain, migration of Essure inserts through the Fallopian tubes into the lower abdomen and pelvis, perforation of the uterus or Fallopian tubes, and rash and itching associated with a possible nickel allergy. In addition, the FDA has recognized 5,093 adverse event reports that have been filed with the agency and advises physicians to warn their patients about getting an implant if they have a nickel allergy. This may seem like a small step, but it shows that the FDA, a large government agency, is listening to the women online, in such groups like Essure Problems, reporting adverse events and expressing their concern over the implant. While it’s a small step, change has been made. Let’s continue to rally together and make the FDA see how dangerous Essure truly is for women.